Dipolog, officially the City of Dipolog (Cebuano: Dakbayan sa Dipolog; Filipino: Lungsod ng Dipolog; Chavacano: Ciudad de Dipolog; Subanen: Gembagel G'benwa Dipuleg/Bagbenwa Dipuleg), is a third class city and the capital of the province of Zamboanga del Norte on the southern Philippine island of Mindanao. Geographically, the city is surrounded by rolling hills to the southeast and the Sulu Sea to the north. According to the 2015 census, it has a population of 130,759 people. A popular city attraction is the foreshore Dipolog Boulevard which, though still in its second phase of construction, has become a popular haven for exercise and leisure. It is also the site for various celebrations and festivals in the city. In the third phase of the project, the length of the boulevard will be extended to reach the seaport in Barangay Galas. Dipolog City is known to be as the "Gateway to Western Mindanao" it is situated in the Northwestern part of the Province of Zamboanga del Norte. It is bounded on the north by Dapitan City, on the east by the Municipality of Polanco, on the south by the Municipality of Sergio Osmeña Sr. and on the west by the Municipality of Katipunan. Its land area in 1914 covered an approximate land area of 248,587 hectares under Act No. 302 of the Philippine Islands. It was substantially reduced in 1951 to the current 13,628 hectares, after two barrios of Dipolog were converted into Municipalities of Polanco, and Piñan under Executive Order of the President No. 467, dated August 22, 1951. 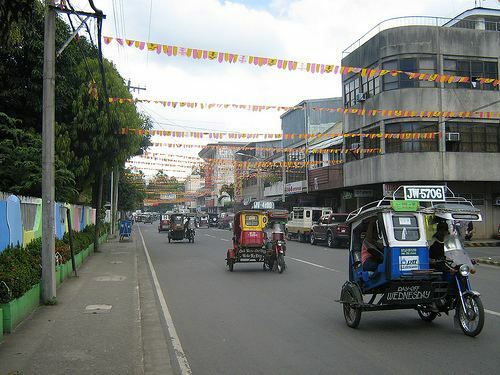 Dipolog City is politically subdivided into 21 barangays. Earliest recorded political history of Dipolog started in 1834 with the re-organization of Spanish Civil Government. At that time, Tulwanan's political territory was still part of the Municipality of Dapitan with Don Domingo Ruiz, a native, as its capitán or town executive. Sometime that year, a Spanish Recollect missionary arrived in Tulwanan looking for its barrio executive or local chieftain. Upon meeting a native, the missionary asked; "¿Dónde está el capitán?". The native understanding only the word "capitán" pointed to the west and said in Subanen Di-pag, meaning across the river. Guided by his servant, a Tagalog boy named Antonio Subido, the missionary proceeded down river and upon reaching the Boholano settlement, named the place "Dipag". Technically, Dipag and Tulwanan were two different settlements at that time with the former composed of Boholano natives and the latter mostly of Subanen ancestry. When the friar returned to Dapitan, he identified the location of the larger Boholano settlement as Dipag but was not officially written. Frequent conversations by the Spaniards pronounced it in Spanish accent Dipolog which was eventually adopted by the natives. The final political survey surprisingly added the letter 'L' written on it after officially becoming a barrio of Dapitan. From that time Tulwanan's political identity ceased to exist. By the 12th century the Subanen settlers had colonized most of what is now Zamboanga Peninsula region. It was customary for tribes to establish their settlements at the mouth of large river systems due to the abundant food supply. However, due to frequent raids from seafaring Chinese pirates, they decided to move their settlements inland. In the 14th century, Tulwanan was established 6 kilometers inland, adjoining the river near the present day barangay center of Lugdungan. In the 15th century, settlers from neighboring Negros and Bohol islands established coastline settlements in Mindanao but suffered the same raids by Chinese pirates, prompting them to also move their settlements away from the coastline. They established another settlement in what is now called Sianib, a barangay of present-day Polanco town, some twenty kilometers from the coast at Barrio Gulayon(Barangay Gulayon). It was only in 1563 that the first recorded Visayan settlement of some 800 families from Bohol, led by the chieftain Datu Pagbuaya, landed in Mindanao and established a coastal settlement in what is now called Dapitan. This settlement was strong enough to repel the Chinese pirates of the Sulu Sea. As a result, Dapitan Bay was scene of many bloody conflicts between Pagbuaya's men and Chinese pirates. In 1565, Don Miguel López de Legazpi who was accompanied by famed navigator Fr. Andrés de Urdaneta, an Augustinian friar, visited the Boholano chieftain Datu Pagbuaya on the invitation of Datu Sikatuna. There they found the place of Datu Pagbuaya to be a thriving settlement. In his chronicle, Fr. Urdaneta named the place Daquepitan. Peter Kaerius (Pieter van den Keere) identified the location as Dapito in his cartographic map of 1598. It was later identified as "Dapite" in Robert Dudley's map of 1646. Other names ascribed to the location include "Dapyto" in Sanson's map of 1652 and "Dapitan" which can be found in Moll's map of the East Indies, 1729 and in Murillo Velarde’s map of 1734. After Legazpi's visit, the Christianization of Mindanao was officially initiated by the Augustinian friars who arrived with him. In 1581, members of The Society of Jesus came to the Philippines for the purpose of evangelization. When the country was divided among four religious orders in 1598, the Jesuits were given the Diocese of Cebu which covered the Visayas and Mindanao. Thus Dapitan came to be under the jurisdiction of the courageous men of St. Ignatius and it was Father Pascual de Acuña S.J. who started the Jesuit mission there. In 1609, the squadron of Juan Juarez Gallinato S.J. defeated the Manguindanau Muslims in a ferocious battle near Dapitan. Also in 1609, a permanent Dapitan mission was founded and thereafter headed by a Jesuit missionary, Father Pedro Gutierrez, marking Dapitan as the Center of Evangelization in Mindanao. Mission stations were subsequently established later by the Jesuits in Zamboanga, Iligan, Basilan and Butuan. Outside of these areas, however, the whole of Mindanao remained untouched by the Spanish Cross. By the 18th century, with the Spanish Naval Fleet anchored at Dapitan Bay, much of the piracy—now conducted mainly by moro bandits—was under control within the Sulu Sea. Settlement in coastal areas resumed with new settlers from Negros and Bohol eventually settling in Isab, and Nipaan. The largest settlement, however, was made at the mouth of the Dipolog river by the Boholanos who were not associated with Pagbuaya. From Ruiz, civil administration changed hands in stable succession, with Martino Belarmino, who was popular by the name Maglinte. Francisco Magallanes, Victorio Gobune; another man whose name history record had as Toribio had his chance, followed by Venancio Narvaez, Francisco Orbita, Bautista Narvaez, Martencio Yebes and Sabino Bengua. By 1889, administrative designations reverted to Capitanes, and those appointed were Martin Fernandez, Tomas Narvacan, Eustaquio Cajocon, Simplicio Lacaya, Basilio Tabiliran, Maximiano Ruiz and Bruno Ordinaria in 1898. By February 1894, the Catholic Chapel constructed by the Jesuits was renovated for the first time, on an altar designed by Dr. José Rizal to which now stands the Our Lady of the Most Holy Rosary Cathedral. By 1896, the friars established Dipolog as a regular parish and installed Father Esteban Yepes its first administrator in 1897. After the transfer of Spanish sovereignty to the United States in 1897, the U.S. occupation forces renamed the Capitan to Presidente Local, with administrative support from a Vice Presidente Local, a Delegado de Justicia and a Delegado de Policia. Martin Fernandez was appointed Presidente Local in the year 1900, followed by Diosdado Mercado, Gaudencio Zorilla and Isidro Patangan as Presidente Municipal between 1901 and March 1904. By 1900, Dipolog was a thriving commercial community with new settlers arriving from the island of Cebu, outgrowing its principal town of Dapitan which exclusively remained part of Pagbuaya's clan. By 1910, John Helper, who was previously appointed Secretary of Zamboanga Province, visited Dipolog for two days and conversed with its principalía and members of the Centro Catolico de Dipolog. He was asked later of the possibility of converting the community to an independent Municipality. By 1912, Gov. John J. Pershing of the Department of Mindanao and Sulu decreed the separation of Dipolog from Dapitan. By July 1, 1913, Gov. John J. Pershing declared Dipolog as a Municipality. General Pershing also appointed Pascual T. Martinez as its first Municipal Mayor. The first public school teachers of Dipolog, during this time, came also from Bohol, particularly Maribojoc and other towns. Most were only elementary graduates. But they were well-educated by the American soldier-teachers in Bohol. One of them was a certain Felisa Ruaya who taught at the American-established schools in Dipolog. She lived first near the beach in Punta Coro. Then she married an Adriatico, a native of Polanco. Because the inhabitants converted to Christianity, it cannot be determined whether or not the residents were of Subanen heritage. Felisa Ruaya was the mother of former Zamboanga del Norte vice governor Concordio Ruaya Adriatico. In 1942, Japanese Imperial Occupation forces entered in Dipolog and built of the military garrison of the Imperial Japanese Army was stationed in the municipality. In 1942 to 1945, Filipino troops of the Philippine Commonwealth Army military units and the local recognized guerrillas began the conflicts in the town municipality of Dipolog against the Japanese Imperial forces during the occupation was until the retreating the local resistance fighters was halted by the Japanese are almost four years during the siege and before the American liberation forces was returned and arrive the town by the enemy. In 1945, the liberation by the Filipino troops under the 6th, 10th, 102nd and 105th Infantry Division of the Philippine Commonwealth Army and 10th Constabulary Regiment of the Philippine Constabulary entered in Dipolog together with local guerrillas. Governor Matias Castillon Ranillo Sr. noticed that the waters at Punta Coro wharf were choppy for ships to anchor. Governor Ranillo was determined to provide an alternative access to southern Zamboanga peninsula. Governor Ranillo's jurisdiction was then the entire Zamboanga peninsula prior to its division between del Norte and del Sur. During Governor Ranillo's term, aviation was a young technology but he made sure that an airfield was established in Dipolog. He was elected Governor in 1937 and re-elected in 1940 but his term was cut short when President Quezon urged him to run as the lone Assemblyman of Zamboanga peninsula. President Quezon fondly called him "El Gallo Escondido de Malacanang". In November 1941, he was elected as Assemblyman but one week before his scheduled departure for Manila, World War II broke out. On October 30, 1944, upon the request of the recognized guerrillas among them the local regular and constable force of the Philippine Commonwealth Army and Philippine Constabulary during the conflicts against the occupation, he mobilized the able-bodied men of Dipolog and Home guards who cheerfully volunteered to clear the airfield of grass and shrubs. On March 8, 1945, on Dipolog airfield, the first American invasion of Zamboanga peninsula took place. The successful landing at Dipolog airfield established a base for the subsequent recapture of Japanese-held San Roque airfield near Zamboanga City, followed by Sanga Sanga in Sulu, and from there to Borneo and the East Indies. The established of the general headquarters and military camp base of the Philippine Commonwealth Army and the Philippine Constabulary were stationed in Dipolog on March 9, 1945 to June 30, 1946 during and aftermath of World War II. By June 21, 1969, Philippine President Ferdinand E. Marcos signed into law the Dipolog City Charter, under Republic Act 5520, making Dipolog a chartered city effective January 1, 1970. Mayor Felicisimo Herrera was made the last Municipal Mayor (1963–1970) and the first City Mayor of Dipolog (1970–1978). On March 8, 1982 the Sangguniang Panlungsod adopted the Dipolog City March composed by Mrs. Antonina O. Romano as the City's official song. The city is now one of the major options for local investors from Cebu, Dumaguete, Cagayan de Oro and Davao and for foreign nationalities from India and Taiwan investing in retail, tourism, services, manufacturing, trade, and wholesale. It is also abundant with natural resources in terms of agriculture with fishpond areas and fishing grounds; fish production with approximately 56 fish species being produced, as well as livestock production such as carabao, cattle, horse, goat and pig. Potential investment areas range from agri-based processing such as activated charcoal, desiccated coconut, broiler contract growing, livestock raising, cattle fattening; construction, furniture, marble, low-cost housing projects, feed mill; food processing or packaging such as meat and fish processing, mango processing and packaging. Currently, the city is well equipped with telecommunication facilities from landlines, mobile networks, 3G broadband. In 2006, a study by the National Statistics Coordination Board (NSCB) found Dipolog City to be the wealthiest city per capita in the Zamboanga Peninsula. Within Dipolog, 23.15% of the population was estimated to be living below the poverty line (households with a per capita expenditure of under $1 a day). In comparison, the NCSB estimated Zamboanga City and Pagadian City as having poverty incidences of 23.81% and 27.15%, respectively. In startling contrast, the poverty rate for the entire province of Zamboanga del Norte (with individuals in both rural and urban settings) was estimated to be 40.36%. Zamboanga del Norte is one of the Philippines's poorest provinces with a poverty incidence rate of 64.6% in 2003, an increase from 47% in the 2000 statistical figures. Dipolog shared much of its cultural history with the ancient town of Dapitan to which it once belonged. It traces its beginnings long before the Spanish conquistadores set foot on the island of Mindanao. Dipolog was previously known as Tulwanan, in native language, literally meaning a settlement by the river. Its earliest settlers all belonged to the Subanen Tribe called Subanon or river people with established religion founded in animism. These descended from the Austronesian peoples who roamed Mindanao and Southeast Asia via land bridges as early as 30,000 years ago Later migrations of other tribes were made by water and took place over several thousand years. Dipolog has its own bus terminal in Barangay Miputak. It provides daily trip to any places in Zamboanga del Norte, Zamboanga del Sur, Zamboanga Sibugay, Zamboanga City, Cagayan de Oro City and Misamis Occidental. Dipolog used to rely in the nearby Port of Pulauan in Dapitan City. The city can now be reached through Cebu-based Medallion Transport Inc. Docking port is at the Dipolog City Feeder Port in Barangay Galas. Dipolog City to Cebu City is every Sundays, Tuesdays & Thursdays at 7:00 PM (PST), while for Cebu City to Dipolog City is every Mondays, Wednesdays & Fridays at 8:30 PM (PST). Dipolog has its airport in Brgy. Minaog. Daily itinerary trips from and to Manila, and from Cebu through Philippine Airlines and Cebu Pacific. Linabo Peak - The 3003 Steps to Linabo Peak offers a panoramic view of the twin cities of Dipolog and Dapitan. It is also the venue for the annual “Katkat Sakripisyo” of Catholic devotees who perform their penitential rites during the Lenten Season. Cogon Park - The Cogon Eco-Park is a 344 hectares reforestation area situated in Barangay Cogon established in 1958. Mature trees are growing wild in the area; species such as Mahogany, Teak, Yemane, Lumbayao, Molave, Acacia, Narra, Mayapis, Lauan, Narig, Tianong, Duguan, Lumbayao, Rattan and Nato. It is also one of the favorite camping sites of different mountaineering groups. Presently, under development in the area are the construction of Information Center, Subanen Valley, Picnic cottages, well landscaped ground at the entrance, parking area, aviary, and different cages for animals. Adjacent to Barangay Cogon is Barangay Diwan, part of the eco-tourism complex housing the Organization of International Spiritual and Cultural Advancement or OISCA Forest Park, a joint project of the OISCA of Japan, locally managed by Heroshi Ikeda, and the City Government of Dipolog. It also houses the Dipolog OISCA Children’s Forest Park. The most prominent feature of the park is the Sungkilaw Falls. Casa Bernedo- a century-old house owned by the Bernedo Family, for tourists. Casa Bernedo is developed as Dipolog’s Center for Culture and the Arts . The ground floor serves as a venue for visual arts and photography exhibits. Santa Cruz - (Punta Corro) is the spot where migrating Boholanos from the Visayas landed and established settlement. A cross was erected by the settlers on May 3, 1905 as a thanksgiving altar to God for their safe journey. Roman Catholic mass were likewise celebrated on this area before the Spaniards established a Chapel 1.5 kilometers inward along the town center street now known as Rizal Avenue. A Cathedral was later erected by the Spanish friars sometime in 1895 replacing the old church, with Dr. José Rizal designing the church altar from a sketch requested by his former professor, Fr. Jose Villaclara, once Dipolog's cura during Spanish Era. 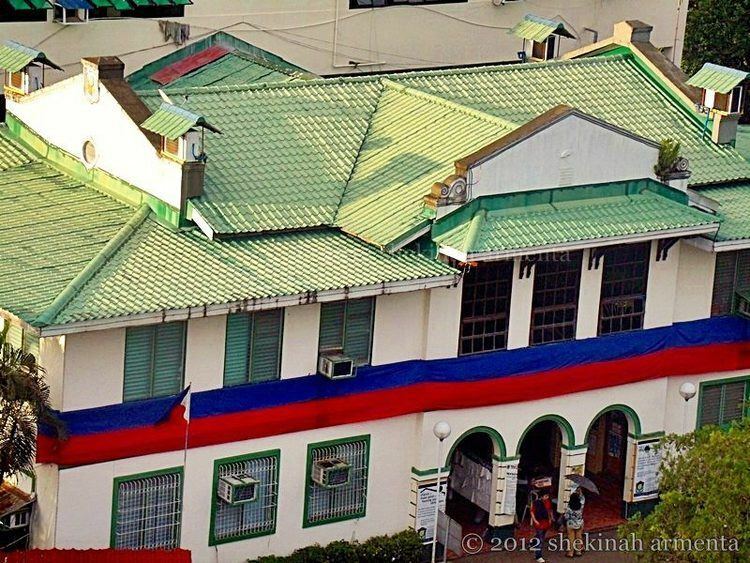 Dipolog City Hall - Built on July 1, 1913, under the administration of General John J. Pershing. The original design of the town wall was the exact replica of the town hall of Maribojoc, Bohol, which was designed by the Americans. The original hall was exactly the same size that of Maribojoc's down to the size of the jail. But today the hall was expanded and its original design can not be seen anymore. 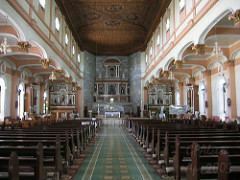 It's located near the Our Lady of the Most Holy Rosary Cathedral and the Plaza Magsaysay. The hall building was constructed under the administration of Mayor Fermin D. Kagatan. The corner street houses the Monument of Three Prominent Dipolognons namely Pascual T. Martinez, the first appointed Mayor of Dipolog in 1913-1918; Rev. Fr. Nicasio Y. Patangan, the first Filipino Diocesan Priest of Mindanao; and Eugenio R. Margate, a farmer for 25 years who introduced the Margate System of Planting Rice. P'gsalabuk Circle - Located at Estaka-Turno road junction is the Fountain of Blessings. 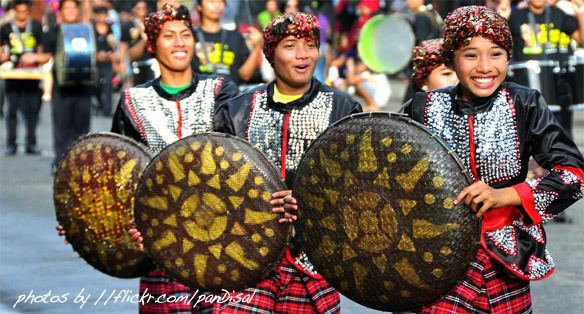 P'gsalabuk is a Subanen (Lumad) term which means "togetherness". The statues represent the tri-people of Mindanao, which symbolize the diverse cultures prevailing in Dipolog. The bowl raised to heavens is a gesture of thanksgiving and offering to God Almighty for the generous outpouring of graces and blessings, bountiful harvests and sustained peace and prosperity. Dipolog Boholana Handicraft & Pasalubong (formerly S and J)- Located at Gen Luna St. Cor Magsaysay near Dipolog Boulevard, Dipolog City, they sell Souvenir products and remembrance products. Tourists are welcome to visit and take a look at the shop's products. The souvenir shop is visited by many tourists, both local and foreign. It is owned by Elsa Leones. In Late 2010 the original S and J is supposed to be located at Bonifacio Street but then transferred. It is also the premier pasalubong and souvenir store in the province. Dipolog Boulevard - Dipolog Sunset Boulevard, or Foreshore Development and Wellness Center, is an esplanade in Dipolog, Philippines. It is a future-proof esplanade which involves the development of 1.6 kilometers stretch of foreshore area spanning from Sta. Cruz of Barangay Central to Purok Bularan of Barangay Miputak. Equipped with adequate facilities like basketball courts and playground park, the city boulevard serves as a tourist destination for every young and old to enjoy. It is also the site of the annual "Pagsalabuk Festival" and motor company trade shows. With the construction of two commercial buildings, which are now ready for occupancy, the complex also becomes a host to prospective locators who wish to do business in the area, augmenting the presently existing restaurants, bars, and several food and beverage peddlers. Extension is currently underway to extend the boulevard for another kilometer reaching the seaport of Galas making it a total of 2.6 kilometers. When completed, it is expected to contribute in the expansion of commercial activities and protection of coastal areas of the city against large sea waves during typhoon periods. Long term plans for the boulevard is extending it in both ways of the city to southern part of Olingan and northern part of Barra creating a new river park esplanade. Also included for foreshore development are areas of Minaog and Sicayab that goes beyond the Dipolog Airport. All of the said plans are drafted in the city's blueprint program named SWIGAPORE 2030 that aims in making Dipolog a self-reliant, super city by 2030 in terms of infrastructure, housing. social and health services. Pasko sa Dipolog (PASADI) showcases nightly shows by Dipolog's respective 21 barangays in the month of December. Saulog sa Zamboanga del Norte (Zamboanga del Norte's Founding Anniversary Celebration) celebrated every first week of June.